Bright colorful bouquet in mason jars- Summertime is all about the vibrant colors, and these make for a perfect centerpiece. For a stunning and memorable table centerpiece, gather mason jars and add bright, colorful flower bouquets along the table. This adds color and character to your reception, and your guests are sure to love them! Sunflower bouquet- We all know that sunflowers resemble the beauty of summer, so creating a centerpiece surrounded by sunflowers and burlap is a centerpiece that will add the final touch to your reception space! 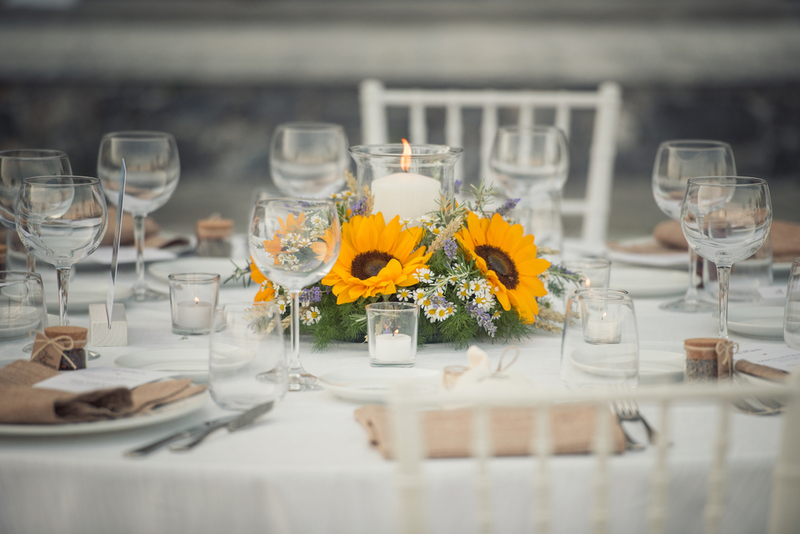 For a summer wedding venue in Atlanta, sunflowers are the perfect addition to your centerpiece! Bouquet with lemons in vase- A simple way to add a lot of character and a hint of summer to your centerpieces, try cutting up a lemon in slices and placing them in a vase with flowers. This arrangment is a really great way to make summer wedding centerpieces on a budget! Reuse old bottles- A great way to make rustic, summer wedding centerpieces on a budget is by reusing old bottles as vases. Adding colorful, bright greenery and flowers to these bottles creates a beautiful display for your guests to enjoy at your reception!